Rethink the way you travel. Discover a world of difference with BRIGHTtravels products that enable you to travel lighter and smarter. Keep your essentials in reach while inflight, on the road, or at home. 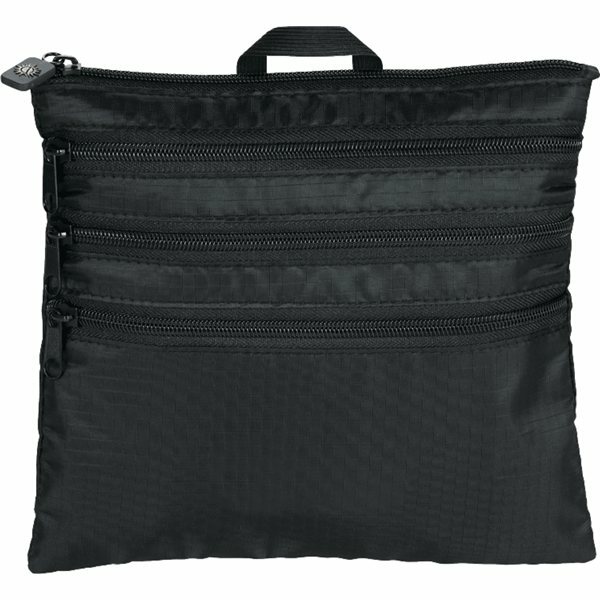 Four pocket pack, include one main compartment that can hold an iPad/tablet, three different sized zippered front pockets ideal for chargers, cords, a passport, a camera, etc. Elastic hook for hanging on the latch of a tray table or the back of car seat. Orange accent interior for high-visibility for quickly locating your belongings. ADDED BONUS - Includes a Pack N' Guide with the Top 5 packing tips to 'Pack Like A Pro'. An excellent product to have on your office table. Great price too. Perfect. Excellent! the perfect place to do business. Thank you so much!! This product was a hit with our staff and clients! the numerous colors available provide us numerous options for our branding activities! The excellent service was a welcome relief too. this is a great item.